The 2016 Cabernet from Penna Lane exhibits bright, lifted fruit, typically currants and hints of mint, with a vanilla and spicy background from the predominately French Oak barrels. The palate is fresh and bright with fruit to the fore, but balanced with complexity and ‘edgy’ tannins, ideal for pairing with roasted meat dishes or, alternatively, aged or blue cheese. 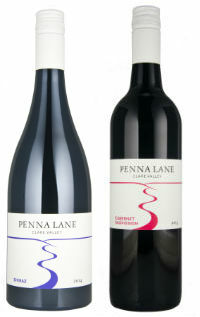 Our approach at Penna Lane is to produce wines that are varietal. They reflect the fruit characters produced in this unique wine growing region, complemented with layers of flavour from appropriate fermentation techniques and oak maturation.